I’m Charlie Nardozzi and this is the Vermont Garden Journal. For those who have been following the Vermont Garden Journal on our Facebook page, Thanks. We now have a whole community of avid gardeners chatting, posting and answering gardening questions. To give you a little sample of the activity I thought I’d talk about some of the more frequently asked questions. Here’s a smorgasbord of gardening questions for late summer in Vermont. Tom’s got a problem getting his tomatoes and peppers to mature to red. Well Tom, after these fruits reach what we call the mature green stage, it can be up to 2 weeks of 70 to 80 degree weather before they will finish ripening to red. Prune off young flowers and fruits to promote faster maturing of existing fruits. 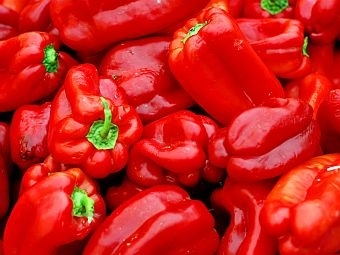 Peppers are, of course, edible once they reach a full-sized green stage, but are sweeter if allowed to mature to red. Sometimes if you add too much nitrogen fertilizer, you’ll get lots of foliage, but your fruits will be late in coming. So be patient and they will turn red. Nancy is wondering what to do this fall with her Endless Summer hydrangea. It’s simple, very little. Endless Summer is a blue hydrangea that flowers on old and new wood. Don’t cut it back to the ground or you’ll lose some of the flowers for next summer. Remove the foliage and dead flowers this fall and add a layer of compost. If you want bluer flowers next year, add some aluminum sulfate too. Ruth has a lot of white dust on her squash leaves. Well Ruth, it’s probably powdery mildew disease. During warm days and cool nights, this disease attacks phlox, squash, melons, lilacs and a host of other plants. If the squash leaves are covered in white powder, it’s probably too late to do anything this year. Next year make sure you space your plants well to promote good air flow, keep the plants healthy, and spray Serenade organic fungicide on the leaves at first signs of the disease. For more discussions on a variety of gardening topics, check out our Vermont Garden Journal Facebook page. Next week on the Vermont Garden Journal, I’ll be talking about asters. For now, I’ll be seeing you in the garden!